When Doom first appeared in 1993 it seemed a huge step forward, and the trailblazer for all the first person shooters that have followed it. Now the game is getting a reboot with the release of the new game due in May of this year. Let’s hope it’s an absolute cracker - for now we have Pops of the games ‘hero’ and one of the monsters - look great! 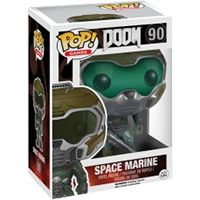 The Space Marine POP! vinyl figure stands around 10cm tall.